Future smoky summers could result in serious financial losses for businesses in the outdoors industry. With recent wildfire smoke causing locals to stay indoors and tourists to cancel plans, Washington state’s outdoors industry is grappling with financial losses, and facing with uncertainty what may become the new normal for Washington summers. During the worst air-quality days on Aug. 20-22, several businesses and organizations saw significant effects. Campbell’s Resort on Lake Chelan reported several cancellations, and webcam footage showed nearly empty beaches in the area. Around Seattle, Argosy Cruises suspended operations for a day, several kayak-rental businesses closed and Seattle Parks and Recreation’s concierge program canceled several park activities. The program’s lead concierge, Philip Craft, said several of his staff members had reported low turnout and visitors wearing masks at some downtown Seattle parks. Victor Steinbrueck Park near Pike Place Market was probably the most affected, said Craft. On the worst air-quality days, the park, which usually sees close to 300 visitors, “just turned dead,” he said. Lopez estimates the club loses as much as $10,000 for every day it has to close. According to Crystal Raymond, a climate-adaptation specialist with the University of Washington Climate Impact Group, smoky skies and unhealthy air quality in summer could become more common in the Western United States as climate change creates warmer and drier conditions that could result in more areas burned by wildfires. 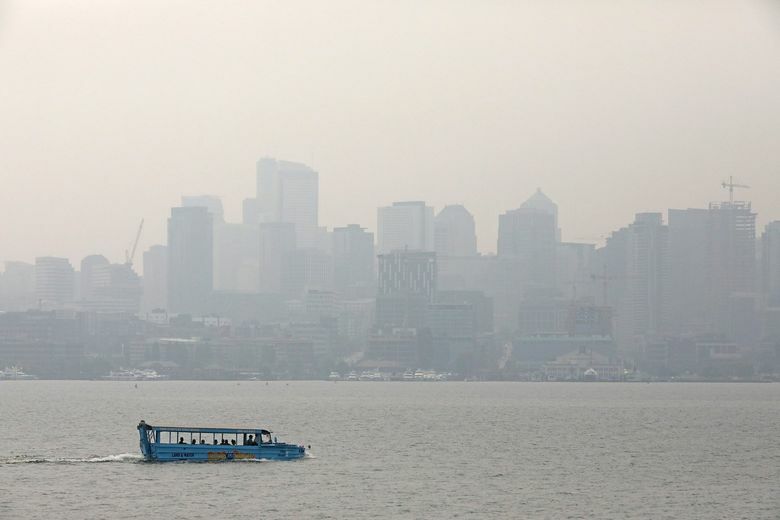 According to Phil Swartzendruber, air-quality scientist with the Puget Sound Clean Air Agency, Washington has had more days of unhealthy air quality this year due to an increase in wildfires compared with last year. In 2017, there were six days that exceeded the National Ambient Air Quality Standard, with air-quality levels that were unhealthy for sensitive groups. This year, as of Aug. 27, air quality exceeded that standard on eight days. Lopez, on the other hand, hopes the next generation will find a way to combat the issue. “I also have a lot of faith in that kids will figure out how to fix this because they’ll have this huge impact from when they were children not being able to go kayaking because it was too smoky,” said Lopez. Hanae Bettencourt, education associate for Seattle Audubon, said the smoke has had an impact on the organization’s Nature Camp programming, with camp supervisors cutting field trips short, limiting time outdoors and moving activities inside. Several parents called to voice concerns about their children being outdoors on smoky days. Others kept their children at home. “One of our policies over the last couple of weeks has been to just keep an extra close eye on the kids and make sure none of them are coughing or feeling poorly,” said Bettencourt. But she said that being forced to be indoors in the summer made the kids anxious. “The best way to enjoy nature is outside,” she said.